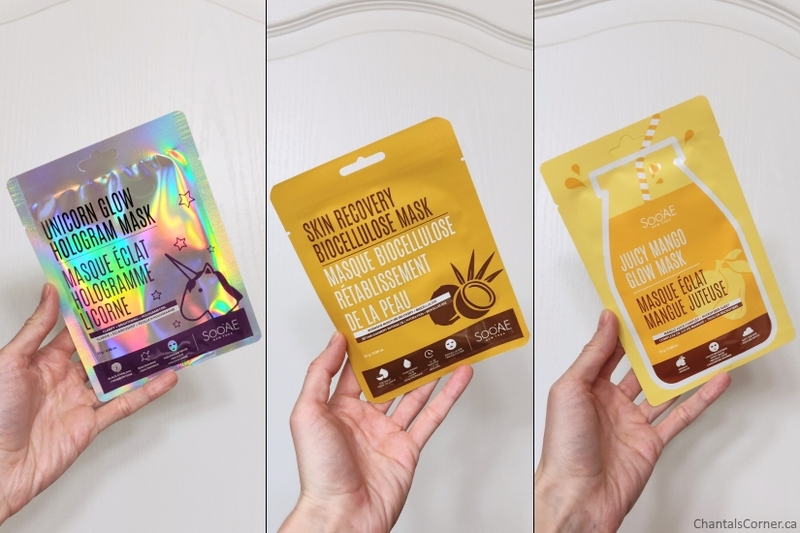 While browsing the sheet masks at Walmart I noticed they had a huge selection of Soo’AE products and I couldn’t help myself, I had to buy some! Are we surprised? lol! So today I’ll be sharing three of their masks with you. 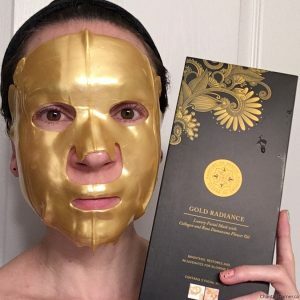 I picked up this mask thanks to Chelle (Makeup Your Mind) who shared her mask purchase on her IG stories. I had already bought a few masks from Soo’Ae and completely missed this one. I just HAD to go pick it up! I mean, unicorn and holographic? Yes please! This mask has a very pleasant fresh scent. The fit is not the best for me though. 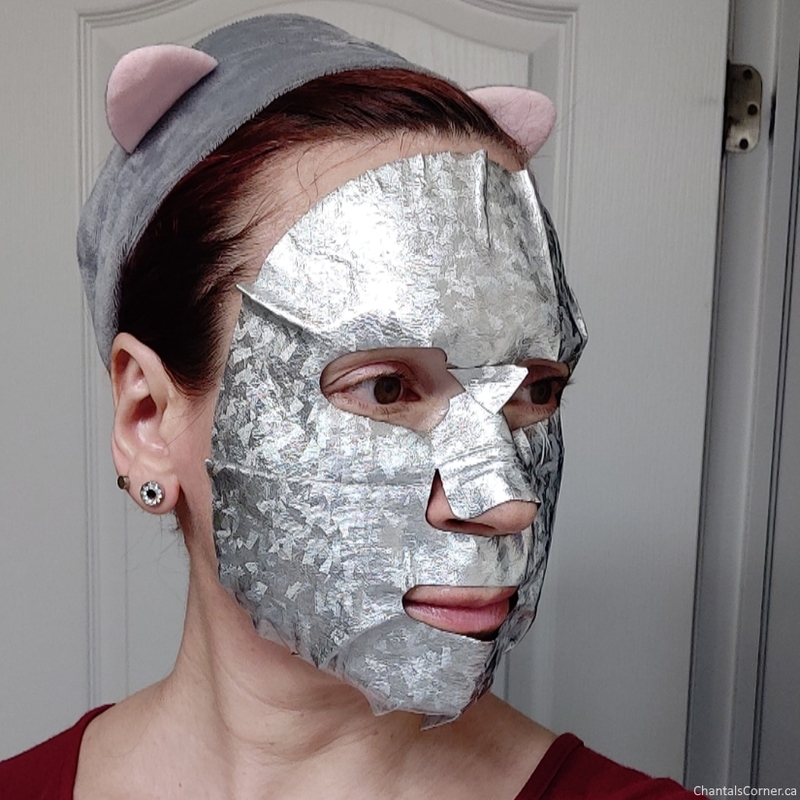 The mask would definitely benefit from having a few slits around the face because the outer foil lining makes it a bit stiff. The eye holes are a little bit small, which is fine. I did my tweak at the nose to make it fit better, but it did not help all that much because of the stiffness. I would have needed to cut both sides of the nose to make it stick to my face. The hole for the mouth is also a little bit small, but that does not bother me either. The mask doesn’t necessarily give me a mask goatee, but I did have to fold it over in some spots to make it fit better and the folded bits do stick out eventually. The mask was drenched in essence, it even dripped on my shirt when I was putting the mask on. The essence of this mask feels a little bit gel-like. 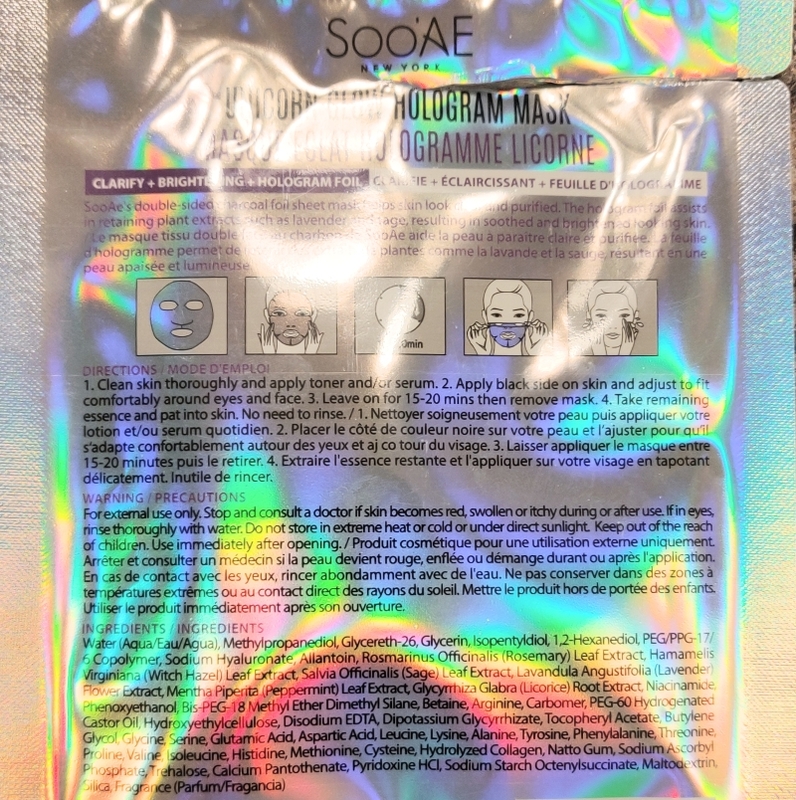 Click here to view the ingredients for the Unicorn Glow Hologram Mask. I kept the mask on for 20 minutes. While wearing the mask I had to pat it down a little bit all over the place, especially around the chin area, to make it stick to the face again because it would lift from the skin. 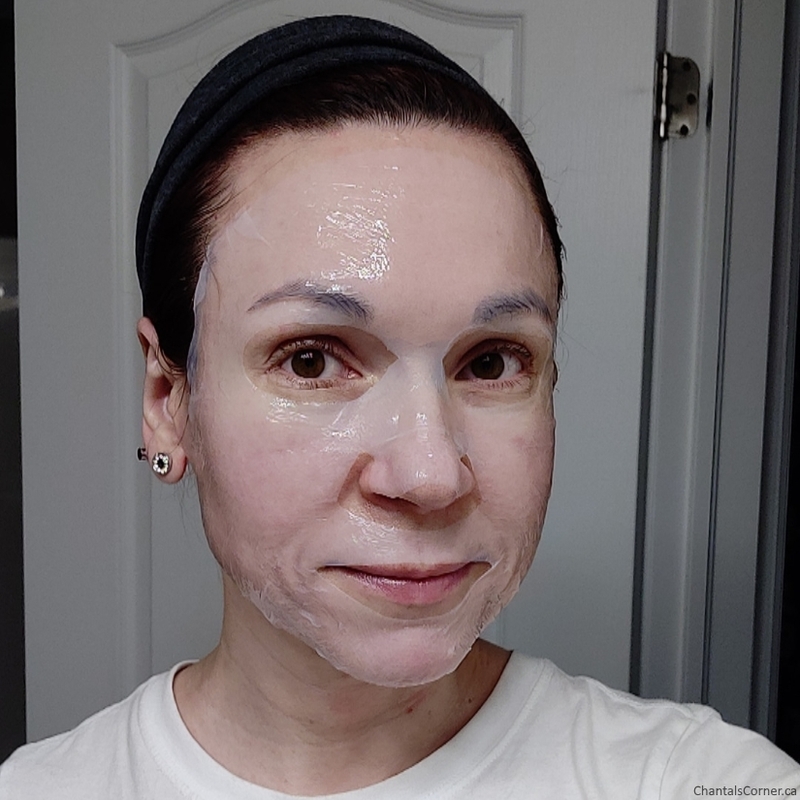 After taking the mask off I massaged the remaining essence, but this masks had so much essence and my face was so wet that it did not fully absorb so I stopped after a few minutes to let the rest absorb by itself. 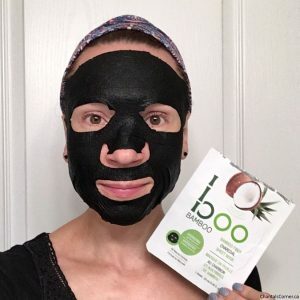 I really noticed a difference in my skin with this mask, it was a lot plumper. I have one big wrinkle underneath my right eye that was barely noticeable anymore. By the time I went to bed, there was no tackiness whatsoever so I applied the rest of my evening skincare routine. 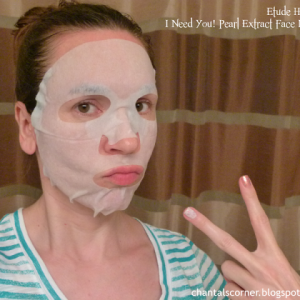 Although the foil made this mask stiff and not my favourite to wear, the effect it had on my face I absolutely LOVED! This mask has a very faint scent. The mask itself is sandwiched between two plastic sheets. 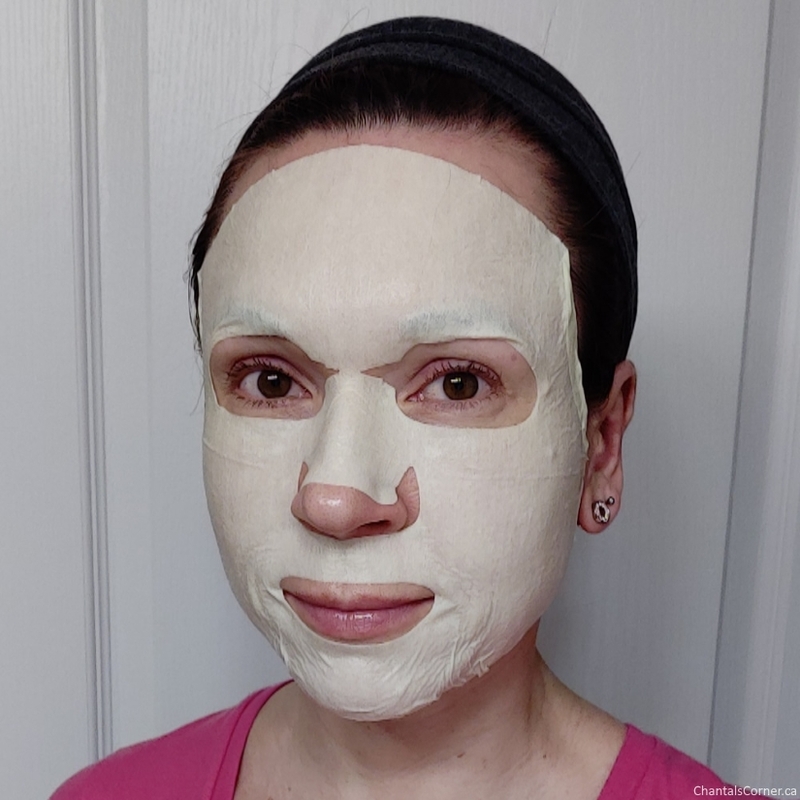 I’ve learned a few things from my month of masking and what I’ve noticed is that bio-cellulose masks are really hard to put on if you remove both sheets before putting the mask on your face because they’re just so thin. So I first removed one sheet, then I applied the mask to my face, then I remove the other sheet. That made applying the masks SO much easier because leaving one plastic sheet on the mask makes it sturdier and easier to manipulate. The fit of the mask is pretty good. There are a few slits all around the mask that make it fit better to the face. The piece between my nose and my mouth kept sliding down all the time even though I pulled it back up often. Because bio-cellulose masks are so thin and stick so well to the skin, I did not get a mask goatee from this one. 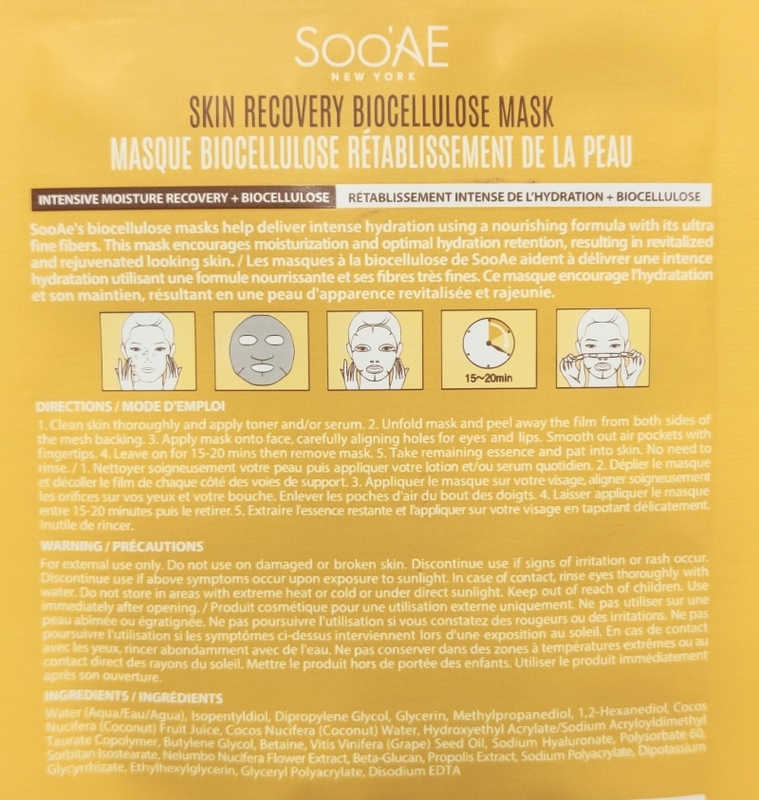 Click here to view the ingredients for the Skin Recovery Biocellulose Mask. I kept the mask on for 20 minutes. After removing the mask I massaged in the remaining essence and it fully absorbed within a few minutes. There was barely any tackiness so I proceeded right away with the rest of my evening skincare routine. I really enjoyed this mask. I don’t know if it’s because of all the lessons I’ve learned from doing the previous bio-cellulose masks, or if there’s just something different about this one, but I really enjoyed it. 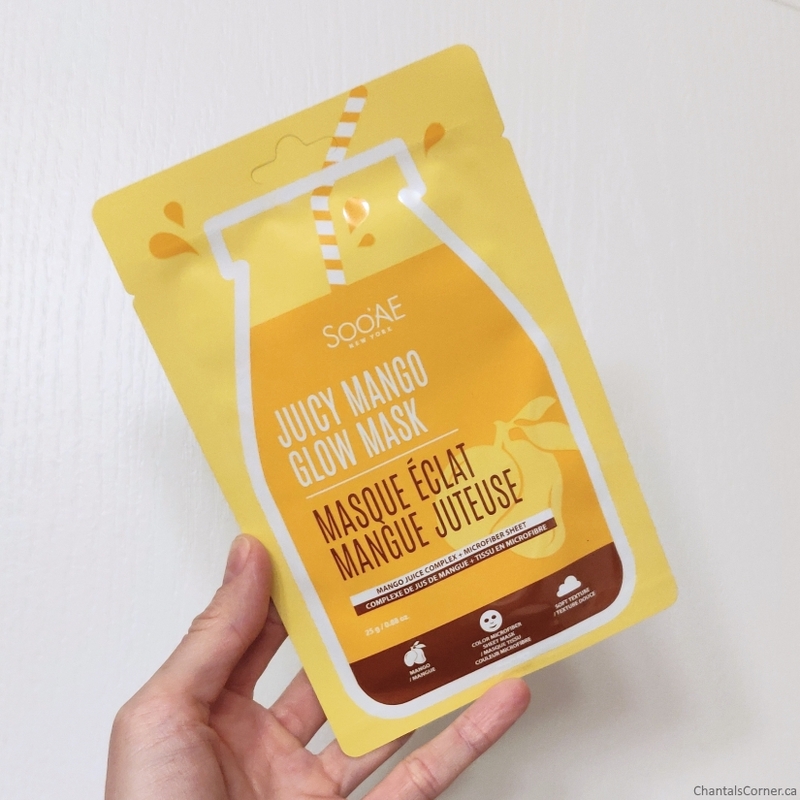 This mask smells so good, it’s kind of like mango vanilla. I really really REALLY like the scent. For some reason, I thought that this was going to be a hydrogel mask, but it’s actually a microfiber mask and its really soft. 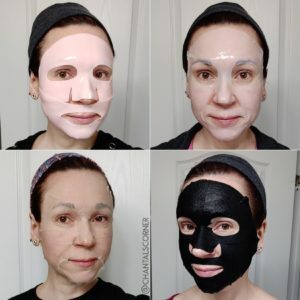 The essence kind of has a bit of a slippery feel to it, but it makes the mask feel so soft and it stays really well on the skin. I did cut a tiny bit between the eyes to make it fit better, but I did not cut fully through as that was not necessary. This mask has a light yellow colour. 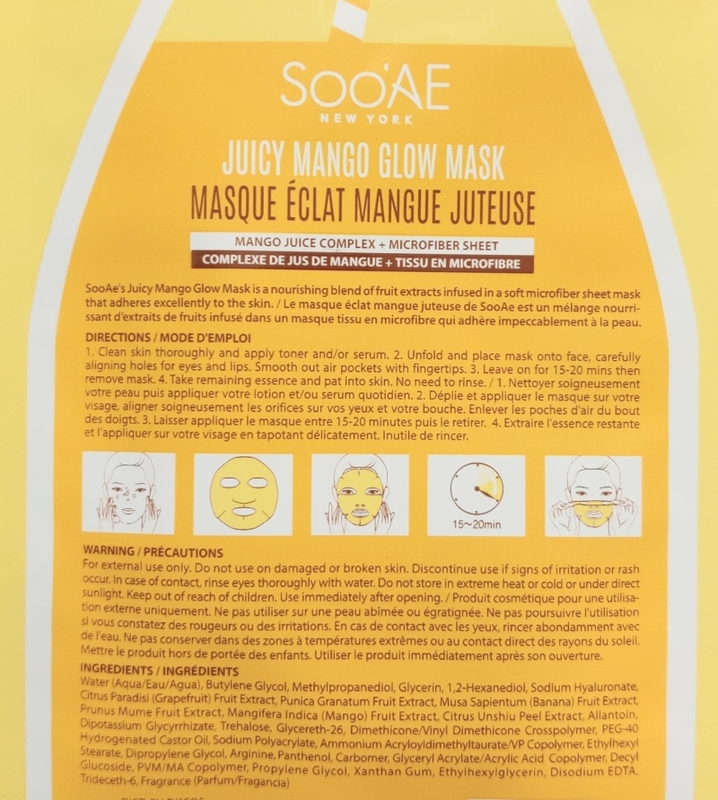 Click here to view the ingredients for the Juicy Mango Glow Mask. I kept the mask on for 20 minutes. Once removed I massaged in the remaining essence and after a few minutes, it was fully absorbed. There was no tackiness so I proceeded right away with my evening skincare routine. I really enjoyed this mask. There is a red version of this mask and I will definitely be picking that one up. I really enjoyed all three masks. 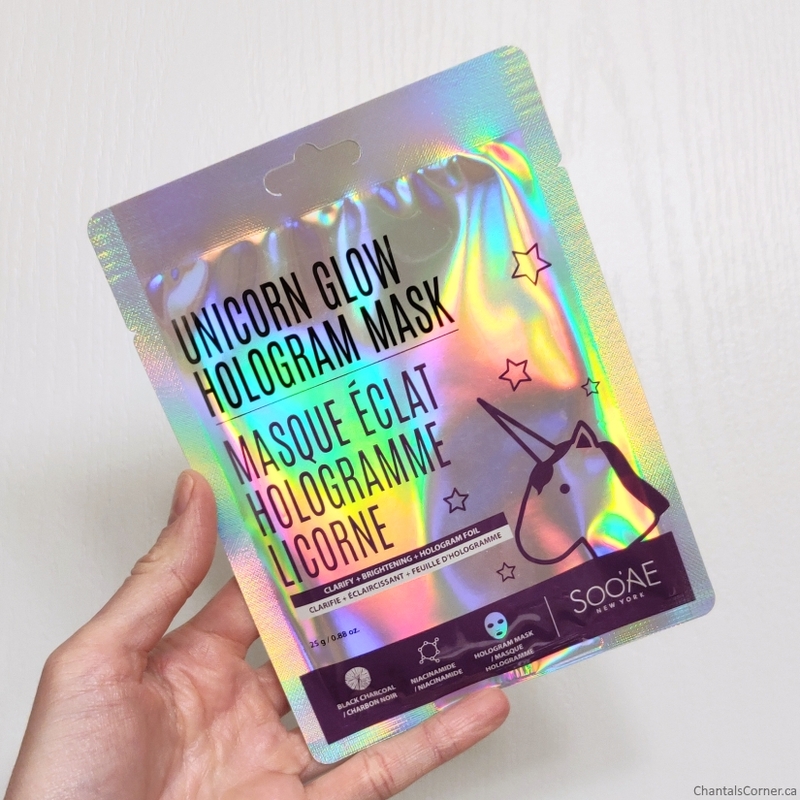 The Unicorn Glow Hologram Mask didn’t fit the best because of the stiffness of the foil, but I really enjoyed its scent and LOVED how plump it made my skin look. The other two masks I enjoyed all aspects of them. 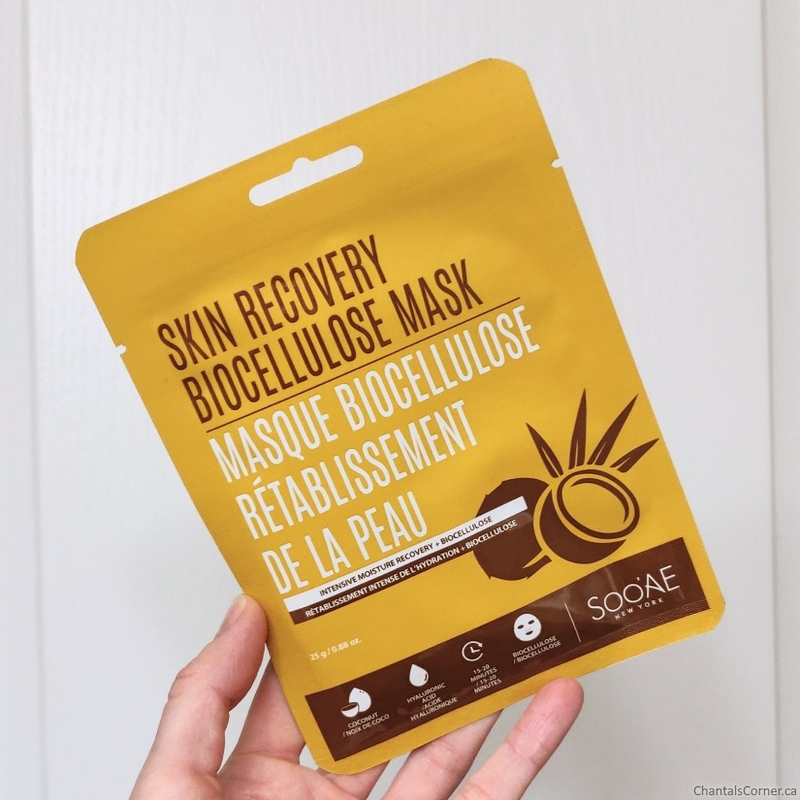 My first experiences with Soo’Ae were very pleasant and I cannot wait to try more from this brand. I have more of their masks already so you can expect another review or two in the coming weeks.